Our first goal program is targeting 5-8U first time hockey player( no skating experience needed ). The program consist in three 45 minutes session spread out over a two & three weeks period. We will loan the full set of equipment* as it is required in order to participate. Our coaching staff will introduce the basic concept & technique and safety elements of ice skating. Three sessions is simply an introduction to ice skating, we recommend for the skaters who enjoyed it to register in our skating school classes which will run for 8-9 weeks and will provide an efficient path for their development. Upon graduating from the various levels of our skate school classes, the participants will be able to enroll in our In-House legends hockey league. Parent’s credit card information will be required upon receiving the equipment from our office, a fee of $250 will be processed if the equipment is not returned after the last session. • THE SESSION IS LIMITED TO 40 PARTICIPANTS. • THERE IS NO CHARGE TO PARTICIPATE IN THIS PROGRAM. • PARTICIPANTS ARE LIMITED TO ONE SERIES. The Toyota Sports Center provides all management, coaches, equipment, and rental skates as well as coordinates all aspects of First Goal Hockey. At the first on-ice session, parents will leave a $200 deposit (credit card or checks accepted) for use of equipment. Deposit will only be cashed/charged if equipment is not returned in good condition at the end of the final session. Kids should come early so they can get dressed and be ready to go on the ice when each session begins. Kids may bring their own skates or use rental skates that will be provided free of charge. Please note - The starter equipment provided to each participant must be returned as it will be used for future programs. The schedule is subject to change so please revisit this page frequently to see any revisions. In the event that you would like to get your child started right away in learning how to skate and play hockey, please visit our Learn To Play page as it may provide you with the opportunity to either start from the beginning of a session or join one which just started. The schedule is subject to change: Please revisit this page frequently to see any revision. 2018 Lil' Kings Learn To Play Hockey Details: Open to children 5-9 years' old for first time players only who have not participated in previous years of the Lil' Kings Program. 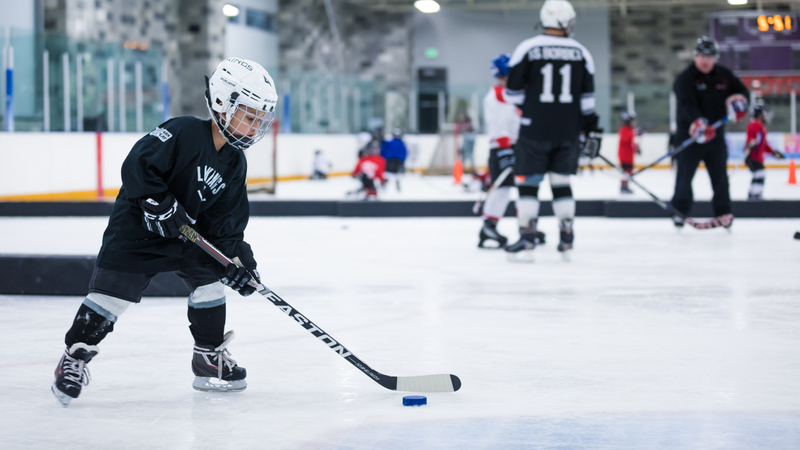 The Lil' Kings Learn-To-Play Program will help your child build character, become a team player, and meet new friends who enjoy the game of hockey! $150 includes 6 on ice sessions and a free bag of head-to-toe CCM hockey gear Deadline to Register is January 12th, 2018. Register today!